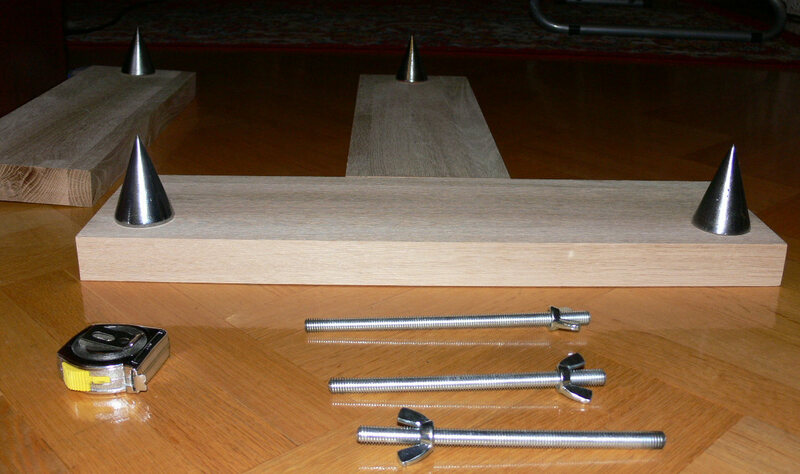 Using some spare time yesterday evening, I went over to LEROY MERLIN and purchased a wooden Staircase Step. But not an ordinary one. This one is made of OAK. 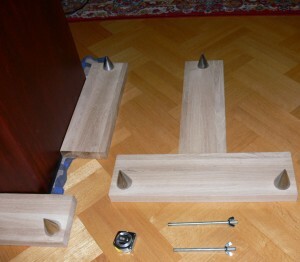 To be more precise, these are profiles of oak slats that are glued together. As the slats are unidirectional, such material promises extreme sturdiness in the directions that are of interest for me. For the price of 30 EUR, I got a sturdy piece of oak, of a size 1000 x 300 x 45. Quite thick, to be frank. Before going to the checkout counter, I took the item to the wood services division, and for a breathtaking amount of 0,50 EUR (= 50 cents) I had it precision cut on a professional machine. It was just that I was the first guy in the history of this service department to come up with such a bizarre idea. Normally they rather cut kitchen table surface intermediate materials. From plywood stuff. So I had it cut into two sets of following pieces: 530x300x45 + 470x300x45. Out of these, I can now build two support structures, in the shape of a capital letter “T”. 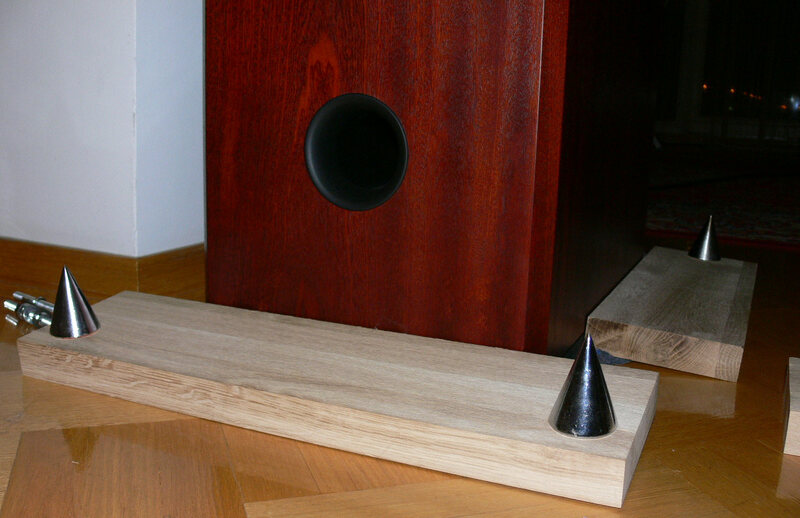 These profiles shall simply be bolted down to the underside of the woofer boxes, and form the basis of a three legged support structure, or “table”. Speaking of tables … did you ever see a table on three legs that wobbles ? I did not. That is why ..
… I shall be making my woofer support structure on 3 feet ONLY. and one single foot, centered, at the back. …things are looking good. The plumbs make a nice fit – they are equally massive as the oak boards themselves. Makes sense. 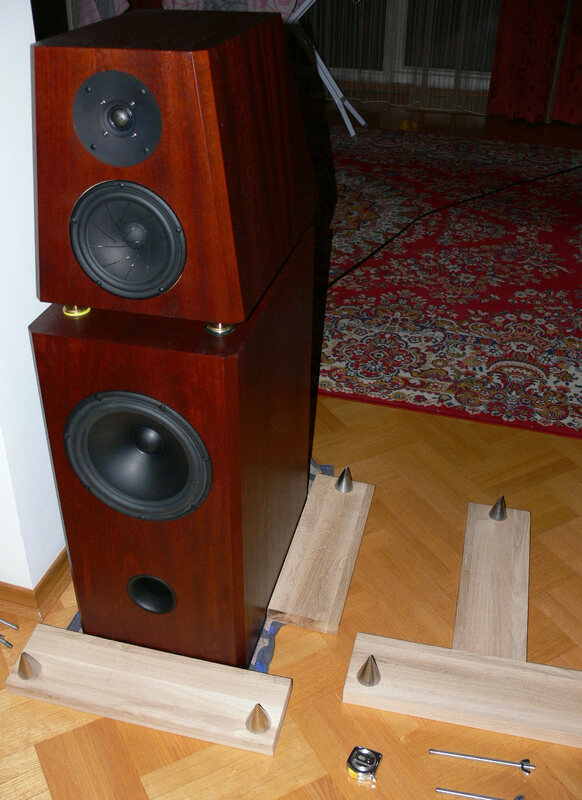 The feet shall actually be spread apart wider than the floor plan of the woofer box itself, so although only on three feet, it will actually be more stable in terms of vertical positioning than it is now. With the 70 mm height of the spike, and the 45 mm of oak, the whole setup will be higher by 135 mm. This is an additional benefit, because currently the tweeters are a tad too low on the horizontal listening axis, for my tastes. 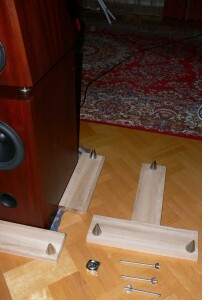 The only problem is that I shall need to drill four M8 through-holes in the floors of the woofer boxes. But hey, if the whole thing turns out to be a bummer, I am left with four holes, out of site. Ones that I can patch up fairly easily if need be. P.S. … B.T.W, what about those crazy butterfly nuts that are laying around there ? Well, as the saying goes: Life is what happens to you, while you are busy making other plans (… so you better be prepared for it). Is that yet another Murphy’s law ? Anyways, the plumb-speaker-spikes shall be mounted by means of these butterfly things. 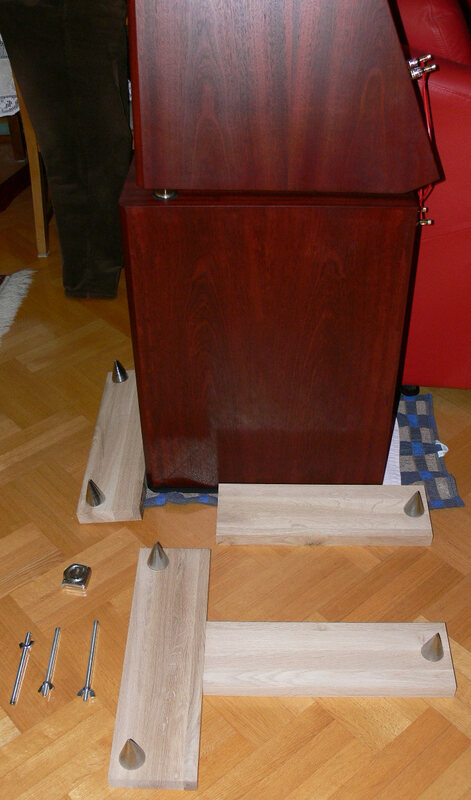 If it turns out that my woman gets fed up with the spikes digging into the wooden floor, for some reason or another, then in the worst case, I shall simply unscrew the spikes, temporarily remove them, and then I shall wait for a turn of sentiment in that particular respect. UPDATE: (14. March): I abandoned the concept of bolting these elements directly to the woofer box. 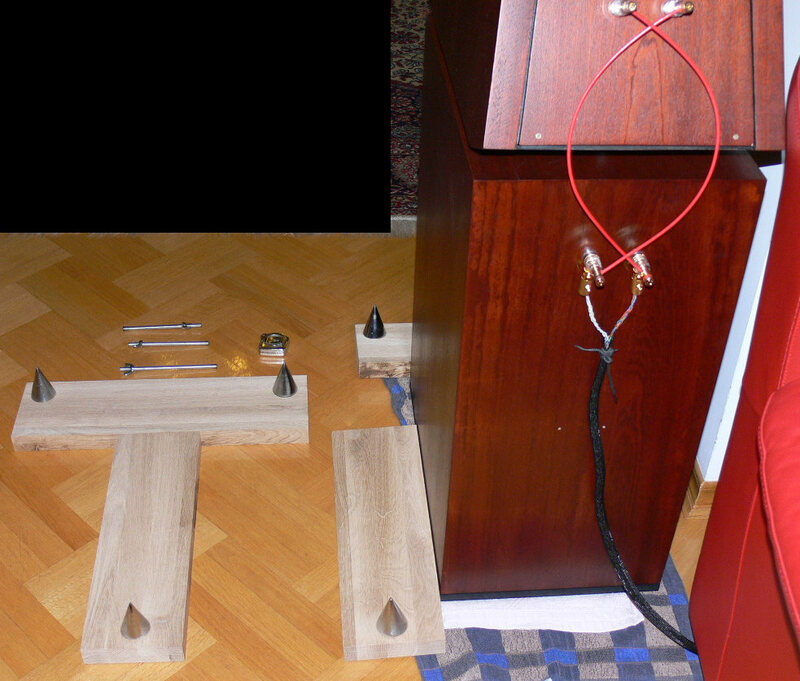 Rather than wrecking the floor of the woofer box with a myriad of additional bolt-mounting holes, I rather pursued the option of purchasing an additional 1200 x 300 board, cutting it, and making separate, totally self sufficient spiked speaker stands (as described in a more recent entry).